It has been almost four years since I left Armagh, Northern Ireland. (And I’m pretty certain I have an old post that starts exactly the same way.) Last month, a former professor contacted me about writing a little something about my trip for ieiMedia’s blog. The post evolved into more of a Q&A, asking me about what I remember most, and any tips or advice I could give to younger students. Click here to read the post in its entirety. Shortly after leaving Ireland, I mapped out all the places I visited. Clicking on each location on this map should result in a little description of what I did there. 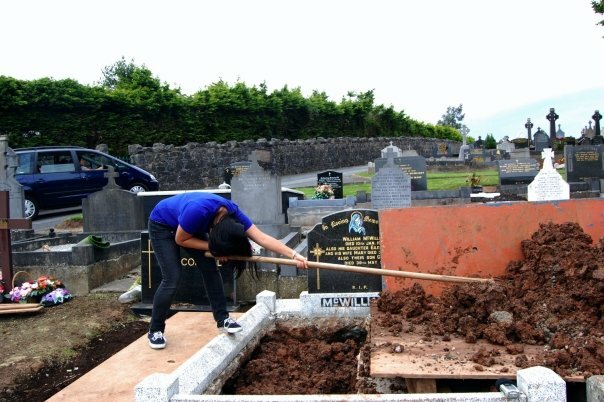 Filling a grave in Armagh. Although it was a multimedia journalism program, I learned more about myself and the Irish culture than anything else. As I wrote in the blog post for them, the program was more of an overview of basic multimedia skills: still photography, audio, video, reporting and writing for the Web. I was already fairly familiar with these skills, but ieiMedia gave me the experience of working on a team in a variety of roles that I had never tried before. Before then, I was content with just being the writer or a page designer, but in Armagh I had the chance to act as videographer, photographer, and web producer. Click here for all the packages produced during that trip. It was also my first time out of the country, and on my own to boot. Although a majority of the students were from SF State too, I didn’t really know many of them. In fact, out of 11 students, I only took a course with one of them before Armagh. So. Four years ago. It was such a short trip, but it lives on in my memory as a touchstone in my life. I know, fairly dramatic but eh. I came home with several strong friendships, and the sense that I could land on my feet in any situation I find myself in (or put myself in).